What separates Andrew Lampe's Wakedead Gathering from the lion's share of xeroxed morbid old school death metal approximations has ever been his application of compelling songwriting aesthetics to the medium. Be that a refined sense for simplistic melody over a primate punishing undercurrent made legion by Incantation in the early 90s, or some other vocal or guitar effect rising to the surface, there is always going to be some focus in any particular song which helps it rise above the gloomy cavern core din that has been growing repeatedly redundant as it nears its second decade of nostalgic popularity. In short, if I had to short-list a dozen wayback-machine death metal abominations worth hearing from here in the States, The Wakedead Gathering would be on that list, and quite likely nearer the top than the bottom. The Gate and the Key, Lampe's second full-length, does not fail to deliver on the promise of its precursors, and gets better with each repeated spin. Hell, I'd recommend this on the sci-fi/horror lyrical themes alone. I'm not positive if it's a unified or partial concept, but Lampe is a master of scribing a grotesque hybrid of cosmic and bodily horror sure to make one afraid for his/her life, much like you might have felt when reading the seminal works of Lovecraft or any of his spiritual successors down through the decades. It reads just as claustrophobic as it sounds, and even from the cryptic cover, which looks like a bunch of ancient pseudopods collected in some sewer manifold, the response is fear...fear and the unknown. This is further manifest through the dank, ominous gutturals that maneuver with a lot of syllabic punch over the subterranean, soil-rich rhythm guitars that serve as a womb for the apocryphal, man-ending lyrics being spewed forth. But where these are fairly commonplace aesthetics in the lieu of an Incantation, Autopsy, Immolation or Rottrevore influence, there is also a real knack for providing the unexpected. Whether it's a brisk, Eastern melody, a spike of airier dissonance, a bluesier doom death progression, or something which combines a number of these, like the fulfilling, eerie harmonies that erupt around the minute mark of "Hypgnosis", you simply can't pull your ears away. It's like an amorphous extradimensional siren in service to the Elder Gods...the creature will bewitch you with lush imagery and a taint of beauty before devouring with its many acid-slathering maws. And none of it would work if Lampe hadn't also mastered the art of making his antiquated death metal sound eerie again, which is accomplished through the simpler techniques of tremolo picking or morbid chords. He can create a spectral, atonal immediacy ("Masquerade in Eminence") or slowly drudge away at your well being ("Vertex I - The Gate"), but either way, he's reaching deep into the well that birthed the genre, and pulling out inspiration from the sediment at the bottom rather than just a bucket of stagnant water off the top. 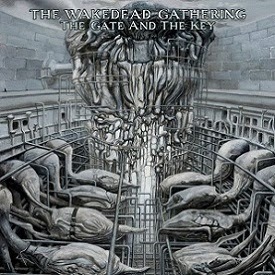 The Gate and the Key is spectacularly claustrophobic and lo-fi while maintaining a strong sense of clarity. Both of the crud-caked rhythm guitars drive straight to your ears, while the double-bass, snares and cymbals carve out a cacophony against the sewer-scape, and the grumbling gutturals seem a direct channel for the ill intentions of the otherworldly, imaginary monstrosities this musician has championed...or at least I hope they are 'imaginary', because if not the future isn't looking so bright. All told, while I might have found individual tunes on the Dark Circles EP mildly more memorable than this material, there is much more of it here, and it's darker, denser...plumbing the depths of sewage and sanity while pounding humanity into a footnote. I kept thinking back to Gozer in the first Ghostbusters flick. 'The traveler has come!' Yes, it's already here, beneath your feet, seeping into the empty spaces of the Earth, making a meal of mankind.